Designed by JustJulie. Powered by Blogger. My biggest makeup obsession has to be eyeshadows. I own more than I'll ever get round to using BUT that will never stop me from ooohing and ahhhing over beautiful eyeshadows, and that's exactly what I had been doing every time I went into Boots and walked past the Stila 'in The Light' Eyeshadow Palette until one day I caved in and just bought the damn thing! 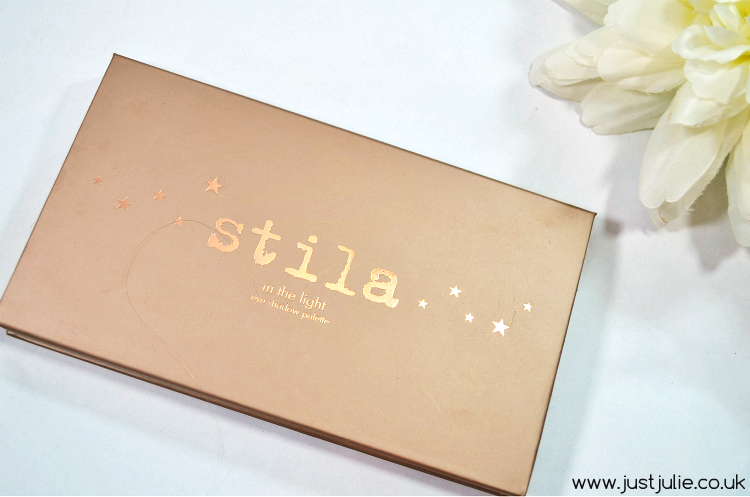 I'd never actually owned anything from Stila until I purchased the In The Light Palette. I'd seen lot's of reviews saying that Stila made really good quality products, but for some reason I just never had the urge to buy anything from them.I actually very nearly bought this a few months ago, but opted for the Smashbox Full Exposure Palette which I reviewed just HERE which to be honest, is very hit and miss. First off In The Light palette comes with ten eyeshadows, four matte shades and six shimmery shades. in a thick cardboard palette. It comes complete with a mirror inside and also an eyeliner pencil. 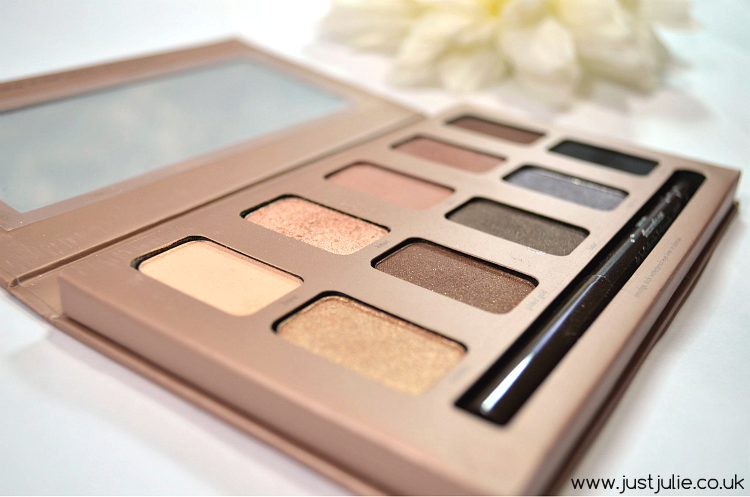 As a lover of shimmer colours for me that amount of shimmers/mattes was perfect for me. The top row is full of neutral shades, where you will also find three out of the four matte shades. The bottom row is full of slightly more dramatic colours (excluding one shade), including one jet black matte shade. Shade wise, I think this has the perfect mix of colours here to enable you to create various different looks from very natural, to more daytime/to night time look all the way up to a dramatic smokey look, you honestly could create nearly any look that you wanted to with this. Quality and pigmentation wise this palette is possibly one of the best, if not the best palette I have ever had the pleasure to use/own. 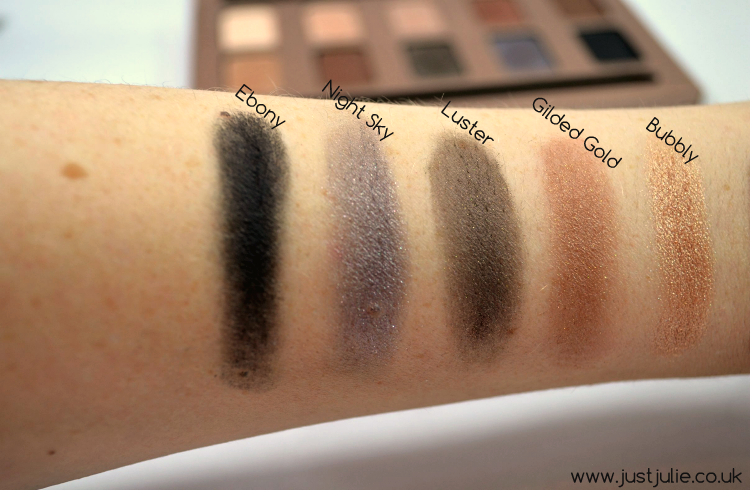 Trying to express to you just how amazing these eyeshadows feel is hard, the matte shades are like butter, not chalky in the slightest, which for any eyeshadow lover out there, you'll know that's very hard to find with matte shades, they normally don't blend in very well and can look a bit patchy if you over blend. Not with these, they are PERFECT, they blend like a dream and there is virtually no fall out! As for the shimmers, now these are beautiful. So pigmented, that you need to just lightly pat your brush into the pan and your brush will be full of lot's of colour. The shimmers are perfect too, unlike the sad excuse of the shimmers within the Smashbox Full Exposure Palette, which were a total let down. There's little fall out, but with any shimmer shadow, you know you're going to get some, but it's not an issue. You can see from the swatches, these are beautiful. 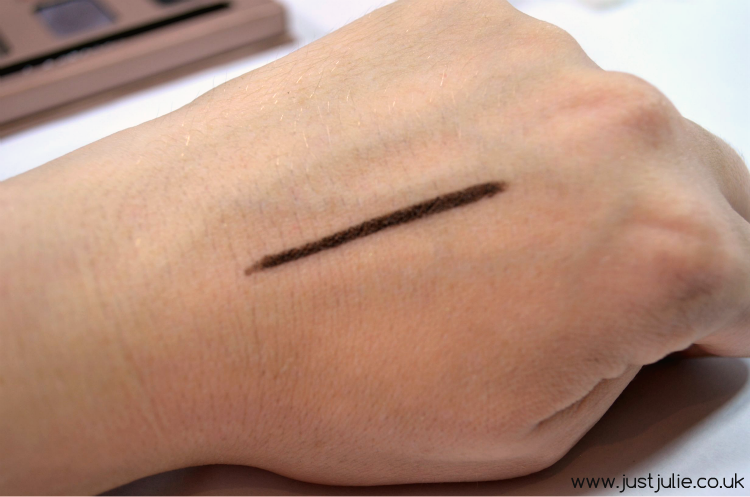 Sometimes swatches don't play out the same when applied to the lid, but like I said, what you see here with the swatches, is what you get when applied to your lid. 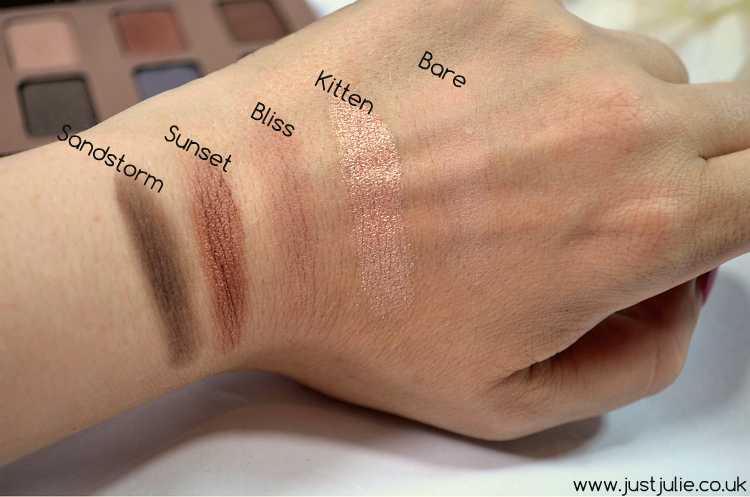 My favourite shades are Bare and Bliss, which are matte shades and Kitten, Luster and Night sky from the shimmer shades. These are the shades that I have been using the most and will no doubt hit pan on way before I do with the others. Not that I dislike the other shades, I like them all, but these five shades are the ones I truly adore and can use in pretty much any look that I wanted. You also get a Smudge Stick Waterproof Eyeliner, in the shade Damsel which is basically just a black pencil. This is very soft and a true black colour. As for it being smudge and waterproof, it does a good job at staying put all day, there was a little bit of smudging in the outer corner of my eye by the end of the day (I wear eyeliner on my lower lash line) but I've struggled to find a pencil eyeliner that doesn't do that to me. My end verdict on this is that YOU need to buy this! If you're a pro at makeup, someone who only wears it every now and then or a total newbie, this palette belongs in your collection. You can create any look (aside from bright colours) with this. the quality is amazing, possibly the best I have ever tried and the pigmentation and staying power is perfect. 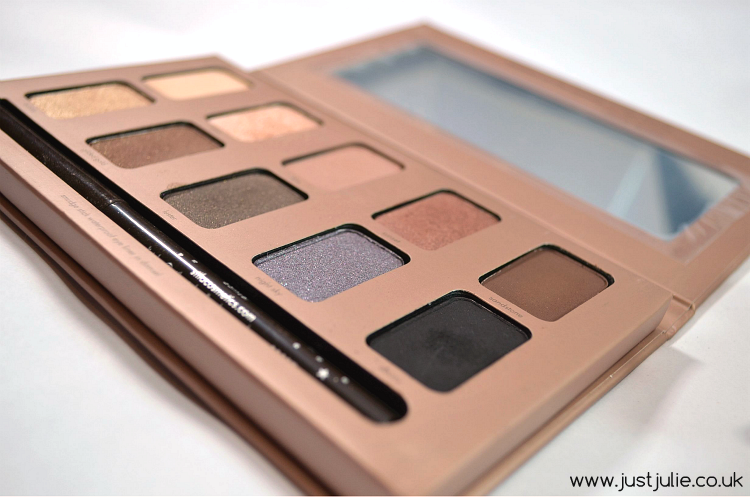 My Urban Decay Naked Palette 3 has been my favourite palette, but this has pretty much taken over my love for that, the quality is even better than Urban Decay eyeshadows, and they are some of the best on the market! 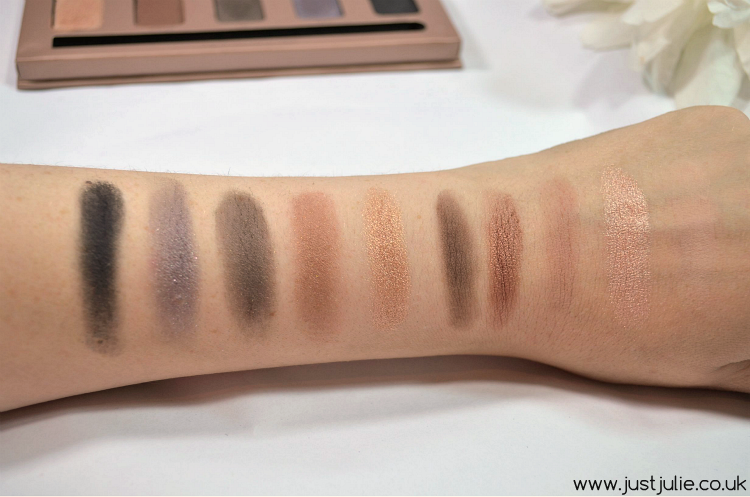 Stila In The Light Eyeshadow Palette costs £25, so the eyeshadows only work out £2.50 each. 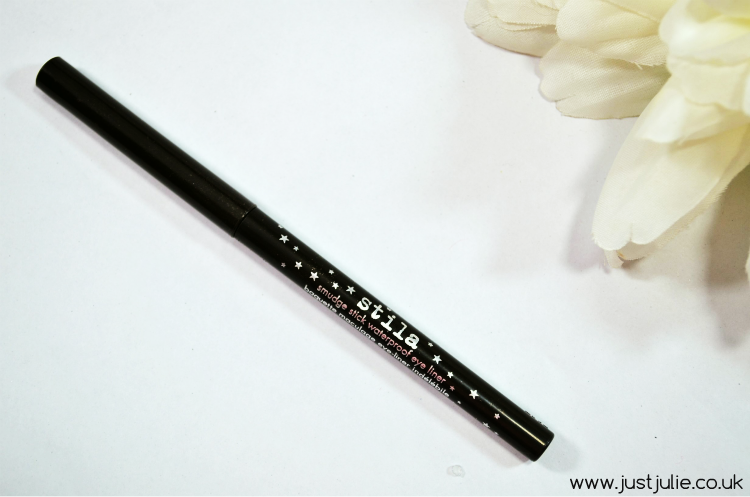 The Smudge Stick Waterproof Eyeliner actually would cost £13 on it's own, so this is really good value for money. I did buy this from Boots but I can't find it on the Boots Website but you can purchase this on lookfantastic.com and Look Fantastic always have discounts, either on the site or you can do a quick google search and you'll find a ton of discount codes available, so you can pick this up for cheaper. I actually have since posted a makeup looking using thus just HERE so be sure to check that out! JustJulie has been shortlisted for the 'Best New Beauty Blog' category in the 2014 Cosmo Blog Awards. If you enjoy my blog you can vote for me to win just HERE Please ensure you keep pressing NEXT until you can input your name and email. Only then will your vote be submitted. Welcome to JustJulie! A Beauty and lifetsyle blog for your entertainment! What I lack in my grammar skills I make up with my honesty and sense of humour! Honest! HUGE One Year Blog Anniversary Giveaway Worth over £400! Bluewater Blogger Meet up Goodie Bag Giveaway! 2 x Winners! 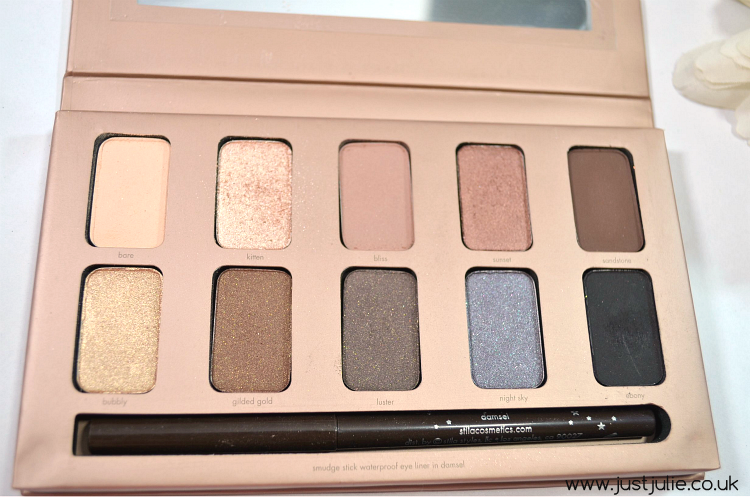 Urban Decay Naked Palette 3 DUPE!!! ghd Aura | The Hairdryer That Will Actually Blow You Away!